Embroidered Happy Birthday Teddy Bear - 11"
This was shipped a distance away, so I didn't see it up close. But it was the perfect choice for a woman who is about to be 80 years young! I know she will love it and place it on her bed for all to see! 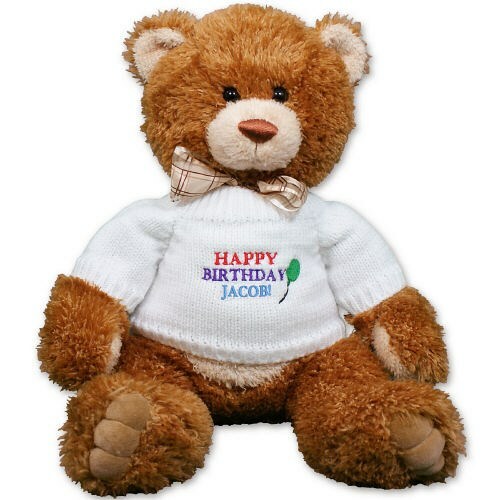 Commemorate a special birthday celebration with our Plush Happy Birthday Teddy Bear. Our Teddy Bear is wearing a comfy white sweater, embroidered with "Happy Birthday" to make him a real special treat!. Sugar Bear is one of our favorites, with rich brown coloring, contrasting fur inside the ears and on the snout belly and paws. Sugar Bear features a wonderful sheer ribbon to make its look even better. Measures 11 inches of lovable sweetness.. FREE Personalization is included! We will embroider the sweater with any name. Free gift wrapping and a free gift message are also included to create a thoughtful presentation. Additional Details When looking for a unique Personalized Birthday Gift Idea, always think 800Bear.com. Birthday Bear Keepsakes are always well received by anyone at any age. Be sure to also take a look at our Musical Birthday Bear and our Plush Birthday Cake Teddy Bear as well.